Stella Rose by Tammy Flanders Hetrick is a dark entanglement of reeling emotionality that throws the reader from the verge of tears to absolute hatred in the matter of mere paragraphs. Stella Rose is the mother of Olivia Weller and the best friend of narrator Abigail Solace St. Claire, and she has just died of Leukemia, leaving Olivia in the care of Abby for Olivia’s last year of high school. Both Abby and Olivia are left to struggle not only with the death of someone they loved so much, but with the pressures of romantic love, friendship, betrayal and everything else that comes with being human. A large part of what keeps the momentum of the book going and what sets it apart from other books of a similar plot is the fact that it’s not simply a sob story about death or the loss of a loved one. Rather, Stella Rose is an exploration of living fully, not in the wake of death, but for the sake of living. There is no glossing over of difficulties, but there is also not a hanging on to the darkness that envelopes the book. Stella is a presence in the book no doubt, but she is not an unfathomably depressing presence. Stella makes her way into the novel through the people who loved her in life and who still love her in death, as well as through the letters that she leaves for Abby and Stella. By the end of the novel, the reader has built as much empathy for Stella as for Olivia, Abby or any of the other characters in the novel in a way that makes the reader miss her all the more. Through all of the ups and downs that Olivia and Abby experience together in their new relationship, nothing could prepare either of them, or the reader, for what Hetrick has in store for them. From insightful to terrifying and every emotion in between, Stella Rose deals with themes of abuse, privacy, passion and the power of friendship while providing strong messages on these topics for readers to take away with them. Hetrick pulls together these themes and weaves them into a story that leaves the reader feeling both stronger and more vulnerable by its completion. There is something about Stella Rose, and it’s not the death of the eponymous character, that lifts the reader from the mundane of daily living to see the beauty in that provinciality, and that is a rare and exciting moment for any reader. 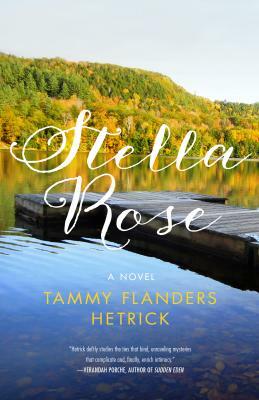 Stella Rose by Tammy Flanders Hetrick is scheduled to be released by She Writes Press on April 21, 2015. You can preorder the book at your local book store. FTC Disclaimer:This book was given to me in return for a fair and honest review of the text.